At a news conference Wednesday, Democratic Gov. 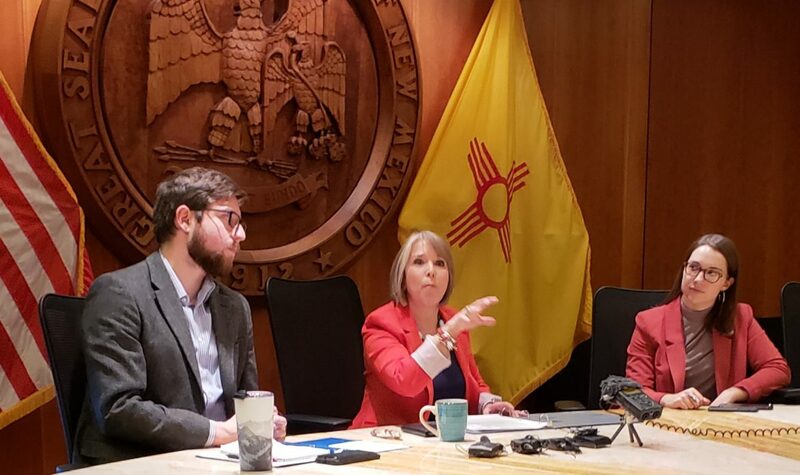 Michelle Lujan Grisham responded to a New Mexico In Depth story that showed while the state has the largest known share of prisoners diagnosed with hepatitis C in the nation, few are being treated. That’s despite new, nearly fail-safe treatment medications coming onto the market at increasingly low prices. New Mexico faces difficult choices, Lujan Grisham said, partly because so much is out of its control. Incarcerated individuals who contract the disease on the outside might only become aware of their plight after a screening in prison, Lujan Grisham said. Beginning in 2009, New Mexico began offering all prisoners screening for hepatitis C, which is not a universal practice. Many other states screen only those inmates who request it. Hepatitis C causes progressive liver damage that can result in fatal liver cancer or cirrhosis. States don’t control the costs of drugs that can cure hepatitis C, either, Lujan Grisham said, adding the federal government hasn’t done much to help keep the prices low. “States have been in an very interesting position between mitigating liability, doing the right public health work and making sure they are meeting their constitutional requirements for prison populations,” the governor said. Despite those challenges, Lujan Grisham said her administration would look into the lack of treatment as the price of the medicines has dropped. Lujan Grisham, who has been on the job for five weeks, last week named Julie Jones, a former Florida corrections secretary, to take over the corrections system and its many challenges. NMID’s story reported that, as of last month, 44 percent of New Mexico prisoners screened for the disease tested positive — the highest known share of any corrections system in the country. In addition, despite a steep drop in the prices for the new drugs, few state prisoners received treatment in fiscal year 2018 — only 46 out of 3,000 diagnosed with the disease, according to the Corrections Department. The state has known for years about the large hepatitis C-positive prison population. In a television interview in 2016, then-Corrections secretary acknowledged the state might be sued if it didn’t expand access to the drugs. Civil rights attorneys are watching Lujan Grisham to see how she handles the issue and are considering litigation if the new governor does not act. Inmates have successfully sued other states, arguing it is unconstitutional to withhold the latest drugs from them. The price for revolutionary drugs, which can cure hepatitis C without the agonizing side effects and lower success rates of previous treatments, have been on the market for a few years but their prices have dropped precipitously, although they are still expensive — running around $20,000 per patient. Lujan Grisham did not mince words about inheriting the hepatitis C situation from her predecessor, former two-term Republican Gov. Susana Martinez. Congressman James E. Clyburn of South Carolina will speak to a joint session of the New Mexico Legislature on Friday as part of African American Day at the Roundhouse. Clyburn, House Majority Whip, is the third-ranking Democrat in the U.S. House of Representatives behind Speaker Nancy Pelosi and Majority Leader Steny Hoyer.